The new Men in Black movie is currently filming with Chris Hemsworth and Tessa Thompson, reuniting the team from Thor: Ragnarok. The duo posted a few pictures from the set as well as a video, showing off how much fun their having. While the term reboot is being thrown around, it looks like the upcoming Men In Black movie will be a traditional sequel, following the events of the last installments, while making something that is new to the beloved franchise. Chris Hemsworth and Tessa Thompson shared pictures with each other on social media, highlighting their nice attire. The selfies are pretty standard and don't reveal anything about the plot for the upcoming film, but they do offer a pleasant look behind-the-scenes that shows how much Thompson and Hemsworth enjoy working with each other. Hemsworth also shared a video from the set of him spinning in a circle and claiming that he does his own stunts, which makes it look like filming on Men In Black is a little slow at the moment. F. Gary Gray is directing Men In Black this time around, fresh off of the success of last year's Fate of the Furious, which earned over $1 billion at the worldwide box office. In addition to Tessa Thompson and Chris Hemsworth, the sequel stars Emma Thompson (reprising her role as Agent O), Liam Neeson, Rebecca Ferguson, Kumail Nanjiani, and Rafe Spall. Hemsworth and Tessa Thompson are playing Agent H and Agent Em, respectively. Filming is currently underway in London, which is a change from the previous New York setting in past installments. Chris Hemsworth and Tessa Thompson already have a great on-screen chemistry as shown in Thor: Ragnarok under the direction of Taika Waititi, who let the cast adlib their scenes. In a recent interview, Hemsworth noted that they are trying to accomplish something "epic" that will stand up to the past Men In Black movies, while also stating that they're injecting a bunch of humor into the film as well, which makes perfect sense. There's a lot to live up to with the performances of Will Smith and Tommy Lee Jones looming in the shadows. In addition to trying to live up to the original Men In Black movies, Chris Hemsworth also says that their trying to make something unique that stands on its own as well. The latest installment in the iconic franchise is slated to hit theaters on June 14th, 2019, which is just a few weeks after Avengers 4 hits theaters. Chris Hemsworth will be back as Thor in the epic Marvel Cinematic Universe film and Tessa Thompson might be back as well, but her involvement has not been confirmed at this time. 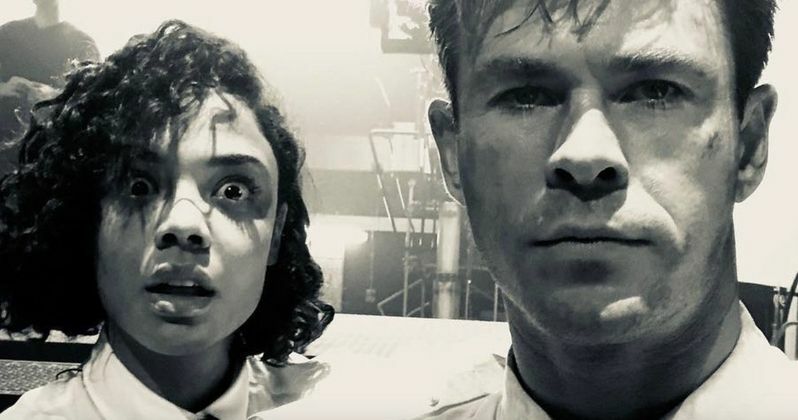 While we wait for the new Men In Black and Avengers 4, you can check out some behind-the-scenes pictures below, thanks to Chris Hemsworth's Instagram page.